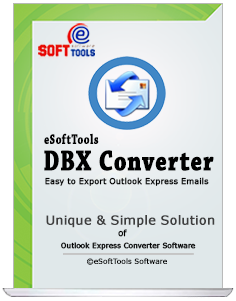 eSoftTools DBX to PST Converter Software for Outlook Express (.dbx) files recovery and Export in multiple formats. Need a DBX reader software to read DBX files email and convert DBX to PST, EML, MSG, MBOX, HTML & RTF file format. Try eSoftTools DBX Converter and get successful conversion from DBX file to PST, EML, MSG, HTML, MBOX & RTF files. Outlook Express stores all its emails in single file .dbx files. Recovery of DBX files and conversion is now much easier and simpler with eSoftTools DBX Converter tool. Tested over 18,000+ DBX Converter at a time. DBX Converter Software Facilitates in the way to easily Convert DBX to PST Outlook with Numerous Others like Convert DBX to EML, DBX to MSG, DBX to MBOX, DBX to HTML & DBX to RTF etc. 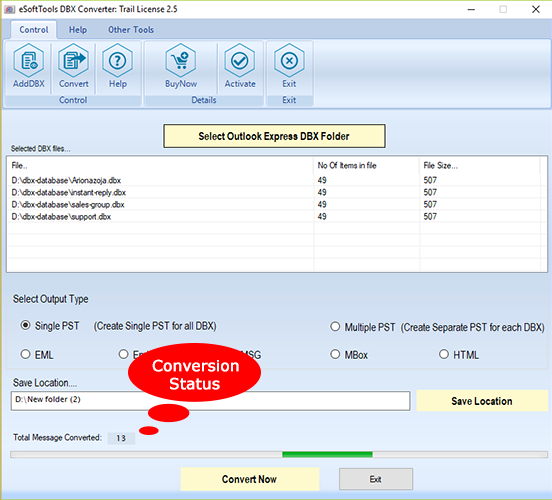 DBX Converter Software is technically authoritative and specialized email conversion program that helps users to recover emails from outlook express as well as convert outlook express file into PST, EML, MSG, DBX, HTML and RTF etc. The software encompasses a group of valuable or significant features that Export DBX files to PST along with complete attachments keeping the integrity of all the folders hierarchy and email attributes safe while the migration task. Efficiently extract mail items from the outlook express DBX files and export all of them into Outlook PST format. After conversion DBX files to PST files, users are capable to save their all data of DBX files into new PST file. 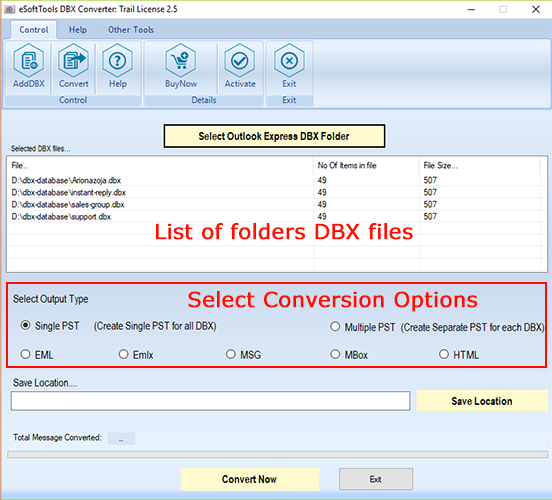 DBX to EML Converter Software enables users to select the single or multiple DBX files for doing the smart conversion into PST outlook or EML format. Add multiple DBX files and smoothly convert a group of DBX files simultaneously. Our DBX Conversion tool is designed for OE mail recovery and conversion. During dbx conversion, all the email metadata (To, From, Subject, Date & Time) and every email attachment will be secured and no changes will be done. 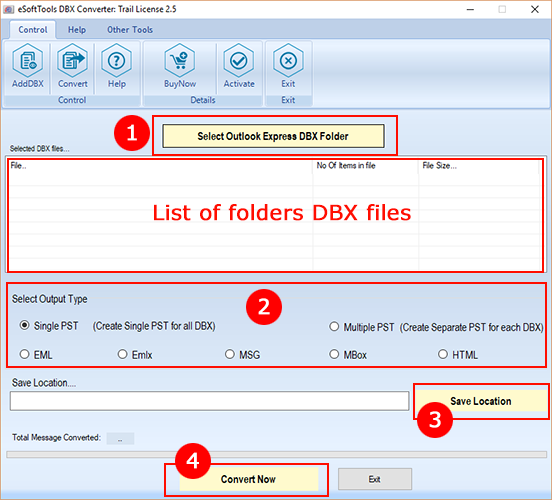 DBX Converter Software supports multiple formats in which users are capable to recover DBX files and reinstate all the DBX files data into PST, EML, MSG, MBOX, HTML and RTF formats with maintains folders hierarchy. Have Demo version of DBX to PST Converter Software - We provide the demo facility to users and allows to view the software conversion functionality and allows save 10 emails from outlook express to PST file or other formats at free of cost. Purchase full version of the software that available at affordable price. Choose distinctively Excel file from various storage locations. RTF stands for Rich Text Format! RTF is a text file format used by Microsoft products, such as Word and Office. RTF is readable by most word processors. RTF files support text style formatting, as well as images within the text. DBX to PST Converter software is the magnificent application. It was recommended by my friend and I would say I am very enthralled with the software. In a solitary time, it speedily transformed all my outlook express DBX files in PST format. Great job guys! .